nice!! may i add some tuna and have a proper lunch? greetings from Greece ! That salad looks like a nice change of pace from the average fare. Looks amazing, I wonder if it would be too much of a deviation to use black beans instead? Exactly perfect. The right simplicity + a break from all that meat consumption. Huzzah and thanks! If you can find it, there's a bicolor sweet corn hybrid called Peaches & Cream. It's unbelievably sweet and juicy, and would be perfect for this dish. Not only was this dish an excellent addition to grilled chicken and roasted cauliflower...it gave me an excuse to quote Sylvester and all his "sufferin succotash" glory. Very nice recipe, Chef John. Have I told you... lately... that I love you, Chef John? I found your blog about a month ago, and it was the greatest thing to happen to me, culinarily speaking, in years. And dutifully, I've been spreading the word. Not much for posting comments, but just wanted to say thanks! This was a great recipe. I never had white beans around so used some black eyed peas. I also added a clove of minced garlic. We really liked it. Thx. I came (to this website), I saw (this recipe), I conquered (my picky pallette). This was pretty darn tasty. Can't wait to share this recipe with others. They'll think I'm a cook or something. Thanks for all the great recipes, Chef John. And thanks to Michele for proucing such a dynamite BBQ sauce! Thanks! I'll pass along to Michele! I put cilantro in it, it came out sooo yummy! Love this mixture of ingredients. However, I keep forgetting that I don't like bbq sauce, which I only eat it once a year. The next time I make this recipe, I will make a balsamic vinaigrette instead. 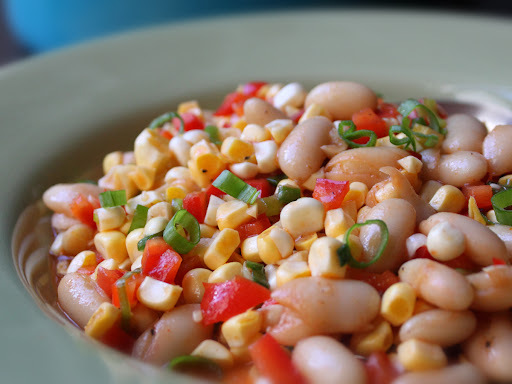 Winner, winner succotash with dinner! This stuff is so good I eat it like its a bowl of cereal. Chef John... YOU 'da MAN! I made the Sufferin Succatash Corn Salad for a pot luck dinner. We LOVED it. I am making it again for a family birthday dinner. Thanks for a GREAT easy recipe. Aim I going to Hell if I use limas? Could I use Cannellini beans instead of white beans?